What conditions does Zofran treat? Tell your doctor right away if any of these unlikely but serious side effects occur: stomach pain, muscle spasm/stiffness, vision changes (e.g., temporary loss of vision, blurred vision). A very serious allergic reaction to this drug is unlikely, but stop taking this medication and seek immediate medical attention if it occurs. Symptoms of a serious allergic reaction include: rash, itching/swelling (especially of the face/tongue/throat), severe dizziness, trouble breathing. List Zofran side effects by likelihood and severity. Before using this medication, tell your doctor of all nonprescription and prescription medication you may use, especially of: tramadol. Try to take each dose at the scheduled time. If you miss a dose, take it as soon as remembered unless it is near the time for the next dose. In that case, skip the missed dose and resume your usual dosing schedule. Do not double the dose to catch up. 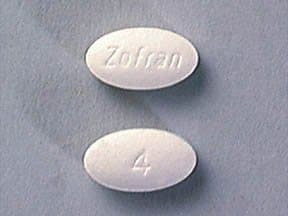 This medicine is a white, oval, film-coated, tablet imprinted with "Zofran" and "4". 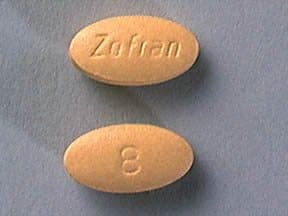 This medicine is a yellow, oval, film-coated, tablet imprinted with "Zofran" and "8". Are you considering switching to Zofran? How long have you been taking Zofran?